This is, as you may know, one of my all-time favorite novels, and I am glad you enjoyed it, even if it wasn’t a favorite. I think the reason it moved me so deeply is because of the discussions of faith and the way John Ames has so clearly thought through his beliefs in an deliberate way. And you could see how his theological thinking influenced his thoughts and feelings about the people around him. That just blew me away because I’ve found that discussions of faith in literature are so often simplistic (whether the perspective is for or against a particular faith). I liked the honest, serious engagement here. And it certainly doesn’t hurt that Robinson is a master of language. I still haven’t read Housekeeping because once I do I’ll have read all her fiction, and she takes her time between novels. I want to wait until I’m absolutely in the perfect mood for it. I’m not wasting that reading! This was such a lovely review, Steph. I haven’t read this book yet, but I really did enjoy Home, and am looking forward to discovering a little bit more about Ames. I think that you described the feeling of Robinsin’s writing brilliantly and after reading this review I am anxious to try it out. I can see that this book is quite a bit different than Home, because it’s main character doesn’t sound as flawed and tortured as the Boughton’s are. Great review, I will be looking forward to this book! A truly lovely review – and I love the bit about hearing Tony’s heartbeat (I have to see if Jim has one – frankly I suspect him of being an alien pod, especially when he helps empty the dishwasher) – but I am totally in the “boring slog” camp. Furthermore, I felt totally outraged that I had been “tricked” into reading the boring slog by the Pulitzer Prize designation. But as you say, it’s quite true some people love this book. I didn’t like this book at all! 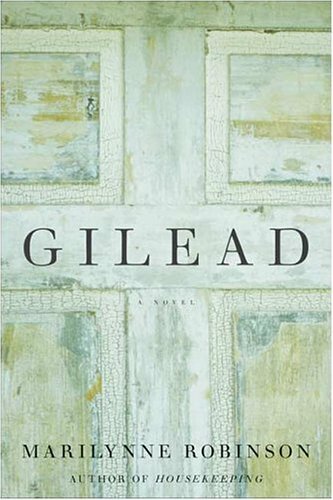 I love the way you say “There are gentle books and then there is Gilead.” I think that sums it up well – this book is so gentle that it is almost static. At least I managed to make ot to the end, which is more than I can say for Home! I love what you said about tolerance and the ideology here being mostly universal. I’ve been meaning to read this book for some time (I’m slowly but surely making my way through the Pulitzer winners), and I was a little bit worried that I wouldn’t be able to relate to it because it’s so tied to Christianity. Not that I’d refuse to read it for that reason, but I wondered if it wouldn’t go completely over my head. I’m glad to hear that there’s enough here to appeal to everyone. Lovely opening paragraph (I love “The Tell-Tale Heart”)! I don’t fancy the book at all, I have to say, but I appreciate your thoughts as always. Excellent review. I confess that Robinson and I won’t be meeting anytime soon, but I always love how the people whose thinking I respect talk about her work. I remember Nick Hornby urging everyone to read her–all the while admitting that she would be a difficult read–when he was still with The Believer. When you mention the single event in life that transpires all the years one lived, my first thought went to The Remains of the Day by Kazuo Ishiguro. Fate has it that I might not be reading this any time soon. Every time when my curiosity has grown to a point that I would just plunge right in, I read a review by a trusted book blogger like you that changes my opinion. I’ve been thinking of this book for a long time; but I’m not ready to read a book of which the writing is not illuminating. This book has to wait. @ Teresa: I didn’t know that this was one of your favorite books, but I based on the reasons you mention, I could see why you’d like it so much! I also really appreciated the careful consideration that was apparent behind Ames’s faith. And yes, I completely understand about feeling the need to hold off on a much beloved author when their back-catalogue isn’t prolific! I have a few authors with whom I feel the need to space out my reads. @ zibilee: If you loved Home then I do think you’d probably like this one a good deal, since I think the approaches are probably quite similar between the two. Then again, some of the tension might be dissipated slightly because you already know a good deal about Boughton, and much of the mystery in Gilead revolves around him. I absolutely see why some people would not care for this book at all, and there were parts that were tough for me as well, but there were things I thought were admirable and made the read worthwhile. But would so many people tackle this one if not for the Pulitzer designation? Probably not! @ Nymeth: I was also concerned about the universality of this text, knowing that it was religious in nature as I went into it, so I was really relieved to find many themes and ideas that would appeal to any reader regardless of faith. There were parts and references that I’m sure I didn’t fully appreciate/get because I don’t have in-depth knowledge of the Bible, but these moments were not as frequent as I had feared. @ Claire: It’s funny how the thought of The Tell-Tale Heart popped into my head when I thought of how to start the review, but I think it works! @ Sasha: I think Housekeeping might be a little more accessible in its style and content, but I can’t say as I haven’t read it. I had picked it up because I wanted to try Robinson and wasn’t entirely convinced I’d make it through Gilead! Obviously I did, but I’ll still read Housekeeping someday anyhow! @ Matt: I think I personally see The Remains of the Day being a story of many moments rather than a single moment, and in that way, I do think it has some similarities to Gilead. Oh, and just to clarify, I don’t think you’d find much at fault with the prose in this novel, but for me, so much had been made of it that I was expected to be really wowed, and I wasn’t blown away. It’s very good writing, but it didn’t change my life is all. I’m one of the ones who really loved this book. I liked how quietly wise it was. I agree that while it is about Christianity, it’s not off-putting or alienating for non-Christians — or at least it wasn’t for me. @ Dorothy: I really appreciated the all-encompassing nature of the book, but probably it would be lost on people who have no interest in religious/philosophical discussions whatsoever. A lovely review Steph. I really couldn’t read this book though – I’ve tried twice, but it’s not for me. @ Annabel: I think I hit this book at exactly the right time. I was in the mood for a quiet dirge-like book, and so it worked for me. But I think it’s a difficult book for most, and completely see why it would not work for everyone.